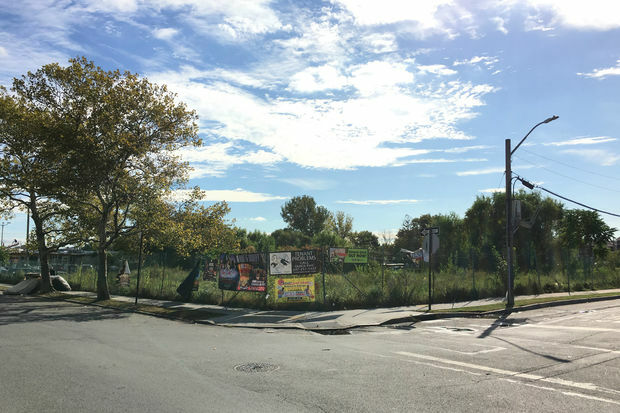 Radson Development has filed plans for a 12-story building it plans to build on this empty lot at 2858 Linden Boulevard between Amber and Emerald streets in East New York. EAST NEW YORK — A developer is looking to build a mixed commercial and residential building in East New York with hundreds of new apartments, including some that will rent for below market rate, according to permits filed with the city. Radson Development, a firm based on Long Island, filed plans Friday for 2858 Linden Boulevard between Emerald and Amber streets, which will include 235 apartments and more than 17,000 square feet of ground-floor retail space, records show. The building will come equipped with bike storage, a second-floor terrace and playground, three recreation rooms, an eighth-floor terrace and green roof, and a parking area with 36 spots, according to the permit application filed with the Department of Buildings. The project, which will rise on what is currently a vacant lot several blocks away from the Queens border, will include affordable units under the city’s inclusionary housing policy, according to public records. Details about the number of below-market units and what income bracket they will be geared toward were not immediately available. Radson Development is a Great Neck-based company focusing on mixed-income buildings, whose other projects in the city include a 12-story building with 165 affordable units in Mott Haven and a planned tower in Hell’s Kitchen that will have 234 affordable units. A nonprofit corporation called HP MJM Housing Development Fund Company bought the Linden Boulevard lot in July 2016 for $6.2 million from property manager Saied Soleimani, according to property records. The building is one of a handful of large-scale projects planned by developers in East New York since the city approved a rezoning of the area, according to The Real Deal, which first reported on the new Linden Boulevard project. The East New York rezoning, which passed in April of 2016, allows for developers to build taller, larger buildings in the neighborhood in exchange for making portions of those projects available to lower-income residents. The rezoning was touted by the de Blasio administration as an example of how to meet the interests of developers while expanding affordable housing, but it drew sharp criticism from activists in the neighborhood and some elected officials, who argued it didn’t go far enough in ensuring that space would be reserved for the neighborhood’s poorest residents. A spokesman for Radson did not respond to a request for comment.